I attribute much of my success as a researcher to the many collaborators that I have had the pleasure of working with during my academic career. I have worked alongside collaborators from diverse backgrounds and educations. We have explored many different lines of research and our work has led to interesting conclusions and fond memories. Without the help of these great people, I would not have experienced the success that I have been fortunate to receive. Brad and I have been working together for five years now. He was my doctoral advisor at the University of Louisiana at Lafayette and we are collaborators on what seems like countless projects together. Brad's work largely focuses on vertebrate anatomy, physiology, and biomechanics. Most recently, Brad's work has addressed the functional mechanisms and energetics of rattlesnake tail shaker muscles. Our work together has resulted in several publications with plenty more on their way. Our collaborations largely focus on better understanding the functional mechanisms that drive animal movements, the environmental factors that impact animal function, and the anatomical and physiological changes that occur in animal performance through ontogeny. I met Schuyler shortly after I read his Master's thesis when I moved to Louisiana. He graduated from the University of Louisiana at Lafayette in 2008. Schuyler also worked with Brad Moon and his research interests parallel and compliment my own interests in snake constriction and behavior. Schuyler and I have collaborated, and co-authored, two recent publications. 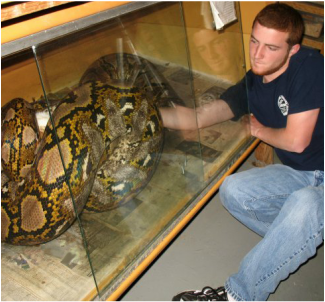 Our first project together quantified the constriction performance in two of the world's largest pythons. Our second project quantified and tested the constriction performance of smaller pythons across their ontogeny and tested the effects of experience on their performance. Schuyler currently works for the Louisiana Department of Wildlife and Fisheries as a Wildlife Biologist. Landon was a fellow Ph.D student and Board of Regents Fellow at the University of Louisiana at Lafayette. He was co-advised by Derek Johnson and Paul Leberg (one of my dissertation committee members). Landon's Master's work focused on calcium dynamics in ring-necked pheasants. His Ph.D work focused on seed dispersal modelling. 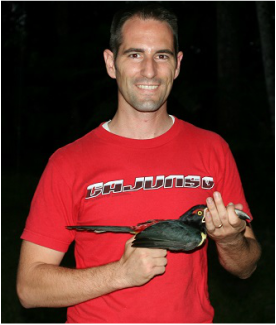 Landon has spent several years collecting data on toucan movements and dietary patterns. Landon graduated in Dec 2017 and is now a Postdoc at Purdue studying bobcat spatial ecology. I work with Landon on several projects centered on quantifying and understanding the linkage between diet and feeding morphology. Using geometric morphometrics, we quantified bill shape across the diversity of raptorial birds in order to better understand how form matches function. Michael is a fellow Ph.D student in Brad Moon's lab at the University of Louisiana at Lafayette. Michael received his Master's degree in 2014 from Austin Peay State University working with Chris Gienger. Michael's Master's work with Chris largely focused on the thermal ecology and habitat selection of cottonmouth vipers. Recently, Michael and I collaborated on a research project quantifying the high-speed striking behavior of ratsnakes. We tested the functional constraints of arboreality (and how those constraints change through ontogeny) on snake strike biomechanics. We are on track to finish this project soon. Michael's Ph.D work focuses on the prey-base affects on the functional morphology and feeding performance in map turtles. Jen and I have known each other since my first semester at the University of Central Missouri. She was an instructor for many of my courses and was instrumental in getting me interested in research. She let me guest lecture in herpetology as an undergraduate and later we co-taught herpetology while I was a graduate student. She also served on my Master's committee. Together, we were involved in several different research projects focusing on the thermal ecology and prey-base energetics of constricting snakes. We also worked together on, and co-authored, a paper evaluating measurement techniques in snakes. 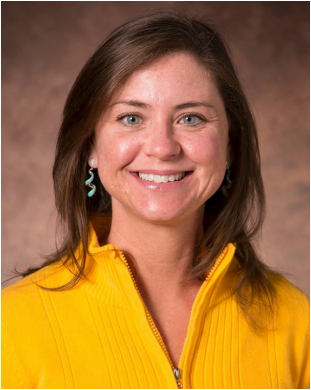 Jen is currently an Instructor at the University of Central Missouri, co-faculty advisor for the UCM chapter of The Wildlife Society, and is pursuing her Ph.D at the University of North Texas. 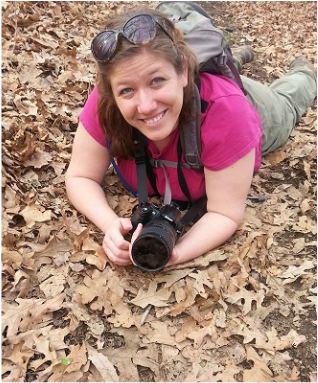 Jen's work focuses on quantifying the distribution and prevalence of Ranavirus in amphibians in Missouri flood plains and FV3 in shovelnose sturgeon within the Missouri River. I met Travis in 2008 during our undergraduate coursework at the University of Central Missouri. We quickly became friends and eventually moved into a 4 bedroom house so that we both could house our reptile collections and finish out B.S. degrees. Travis later graduated with his Master's degree from the University of Central Missouri in 2014. 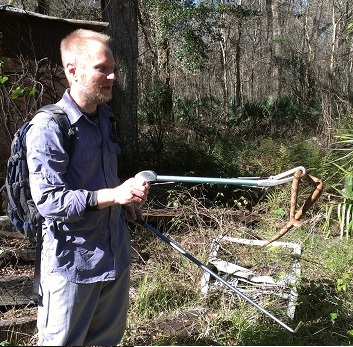 His work focused on the population biology of timber rattlesnakes in an urbanizing area. Travis and I work together on a project monitoring the movements of snakes into and out of a small cave system during thermally limited months. Travis is currently an Environmental Specialist at the Missouri Department of Natural Resources. Leslie and I met at the University of Central Missouri (Stefan Cairns was also her Master's advisor). She was the Instructor of an Ecology class for which I taught several portions of the lab. Her Master's work described and quantified the herpetological diversity in Southeastern Missouri and she has extensive field experience from her work in the Appalachian mountains. Leslie and I worked together to supervise an undergraduate researcher who was interested in feeding behavior in snakes. We also worked together on, and co-authored, a paper evaluating measurement techniques in snakes. Leslie is currently an Instructor and Ph.D student at South Dakota State University. Her doctoral work nvestigates the impacts of neonicotinoids in prairies. Stefan and I have worked together since 2009; he was my Master's advisor at the University of Central Missouri. Stefan received his Ph.D from the University of North Texas. He has a very energetic personality and is a passionate teacher, ambitious biologist, and great friend. His research interests are broad, and he has advised a plethora of graduate students in a diversity of research topics. 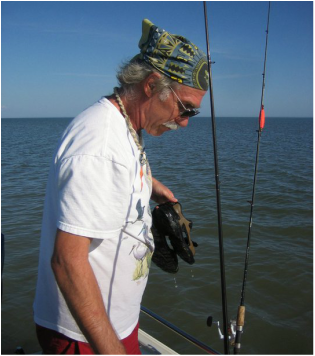 Stefan's main academic focus is applied aquatic biology. Our collaborations included projects on snake behavioral development, thermal ecology, methodological efficacy, and prey-base energetics in snakes. Stefan and I are coauthors on three publications.